The tropical climate offers us colourful and exciting delicacies such exotic fruit, palm trees, perfect beach weather and a lovely, glowing complexion. We all look forward to these luxuries when travelling in the summer months. Fear of death by exposure – or having cold toes – means that I am more likely to go trekking in Australia, Thailand or the Bahamas rather than Switzerland. The heat suits me and it makes packing lighter and easier. The downside to the tropics is the tropical sticky humidity. Great for swimming but disastrous for open wounds, acne and curly hair. Sweaty necks, sticky clothes, wet bottoms after 2 minutes on a bicycle seat. First world problems they may be, but if we can alleviate the discomfort, then we should. Some people manage to stay fresh, sweet-smelling and elegant. I used to journey across the globe looking like a dishevelled little orphan with blotchy skin, a DIY haircut, sweaty jeans. When I couldn’t bear to see snapshots of myself I knew it was time to get organised before a trip. I think after years of research I am finally discovering how to pack for the tropics, so give these tricks a whirl and see how much more comfortable and alluring you feel . The effort and cost of being glam need not be high, all that is required is preparation. Clockwise from the top: sample hair masque and body creme, deodorant wipes, hotel size shampoo and conditioner, perfume sample, makeup wipes. These are the contents of a perfect travel bag, samples and travel bottles are the trick – with these, all you need is a sarong and hiking boots and you can get the next bird out of town headed for Papua New Guinea. 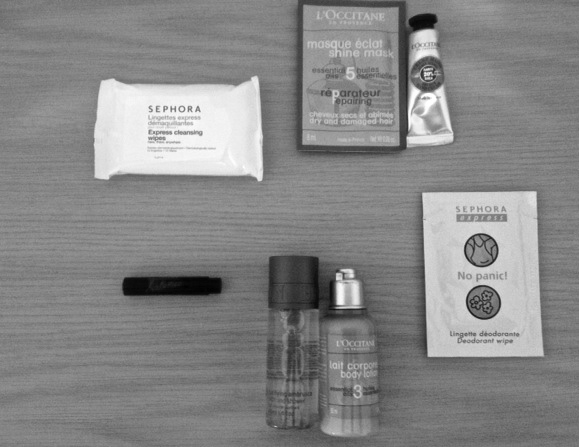 Now, small packages doesn’t mean you have to compromise on quality: I spend all year collecting samples and Sephora sell body butter, makeup remover, deodorant, and body scrub in tiny, fairy-size containers for those on the move. The following list is for lady travellers, but the gentleman explorer can still learn a thing or two here. I hope this is of some help to you all before your summer holidays, all of the following items will fit into your bathroom bag and it weighs less than 550mg for a 2 week trip. ♦ Lucas Pawpaw Ointment, which I think can only be bought online in most countries but it’s worth it: This natural Australian product can be used on lips, dry skin, cuts, rashes and insect bites. I’ve never travelled without it! ♦ Deodorant wipes such as La Fresh, Herban Essentials or Sephora’s “no panic” wipes. They are all good. I carry Herban Essential yoga wipes as they can be used on your body or on a chair/phone/child/toilet seat/wall, etc. ♦ Johnson’s Pure Cornstarch Baby Powder is helpful if you are a particularly sweaty person. Prantal Powder is nice too if you are prone to skin infections. I don’t think talc is very good for the skin, these talc-free alternatives are much more effective and smell quite pleasant. ♦ Jeans – I’m sure you look great in them but they are for the tropics. Invest in some thin trousers, shorts, skirts or a sarong – washing jeans every day can be bothersome and they do go stiff after being worn by a sweaty person for more than 2 days. Thank you! Yep, it’s up there on the list: I favour Banana Boat as it lasts all day and I think it’s SPF50 these days. It smells good too.